Variable pitch propellers have been around a long time. Aviation pioneers often adjusted propeller pitch from the ground, and it was L.E. Baynes who patented the first automatic variable pitch “airscrew” in 1919. 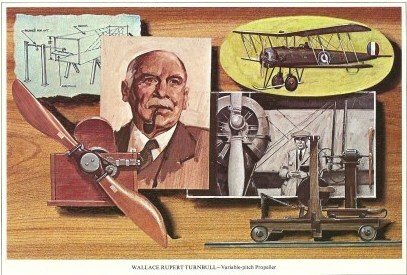 The first true variable pitch propeller patent belongs to Wallace Turnbull, however, who patented his design in 1922. Yet it wasn’t until 1932 when the first truly controllable variable pitch propeller was put into general operation. So how do variable pitch propellers work? It’s the aircraft’s propeller that is the source of thrust that moves a plane forward. Propeller-driven aircraft moving at varying airspeeds must have adaptable propellers so that the blades don’t stall with the varying thrust and airspeed of the aircraft. When you can control the pitch of the propeller, it improves the performance of the aircraft across varying speeds. When an aircraft is standing still on the ground with its propeller in operation, air easily flows past the leading edge. As the plane speeds up (whether on the ground or in the air) the force of the air against the propeller increases, creating more drag. A variable pitch propeller can be partially rotated along its longest axis to take a bigger bite of air as necessary. In this way, the pilot can manually adjust the propeller pitch so the propeller always maintains the most efficient flow of air around it as it operates. Allowing for variable pitch dramatically improves fuel efficiency and performance. Image credit: Wallace Rupert Turnbull biography from General Motors Canada collection.